PB & J will always be near and dear to my heart. 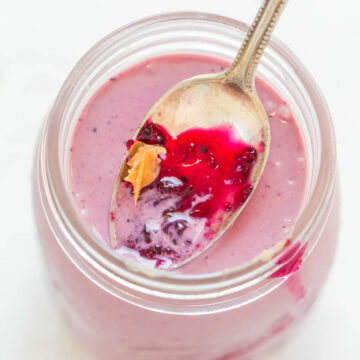 One of those classic flavor combinations that you can never go wrong with and now it’s PB & J in smoothie form. Although this sounds like a total rookie smoothie-making admission, I have never been able to get the perfect PB & J flavor I’ve always wanted in a PB & J smoothie until now. Either the peanut butter overpowered the jelly flavor completely. Or the berry combinations I was using to achieve the jelly flavor weren’t right, usually too tart, and sour berries in a smoothie are the worst. I’ve even tried adding actual jelly but it got lost since peanut butter is such a dominating flavor. The smoothie gets its jelly flavor from berries rather than actual jelly. My solutions to perfecting this smoothie include using a very ripe banana. You can’t taste the banana but it adds oomph, creaminess, and great sweetness to the smoothie. And use vanilla Greek yogurt which also adds thickness and creaminess. And of course don’t be skimpy on the peanut butter. This is what I call the perfect peanut butter and jelly smoothie. 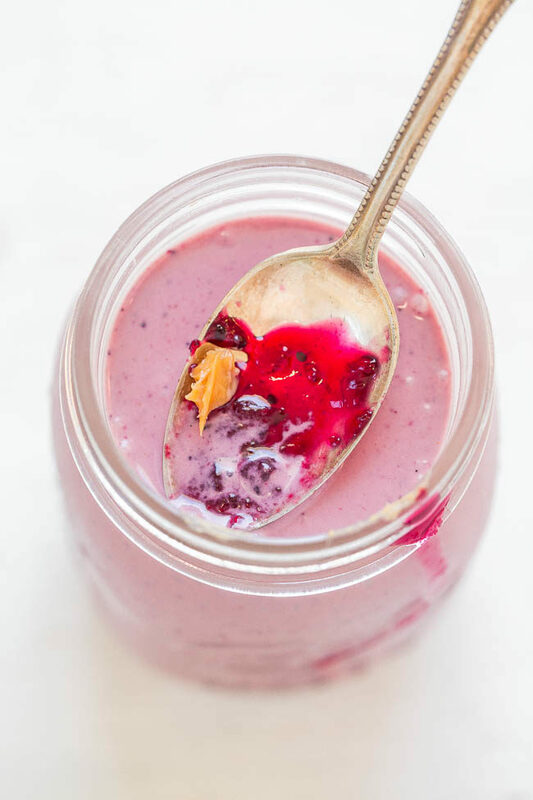 The perfect PB & J flavor in smoothie form. You can’t taste the banana but it adds oomph, creaminess, and great sweetness to the smoothie. Canilla Greek yogurt also adds thickness and creaminess. The smoothie gets its jelly flavor from berries rather than actual jelly. And of course don’t be skimpy on the peanut butter. optional sweetener to taste, i.e. Splenda, granulated sugar, stevia, honey, agave, etc. 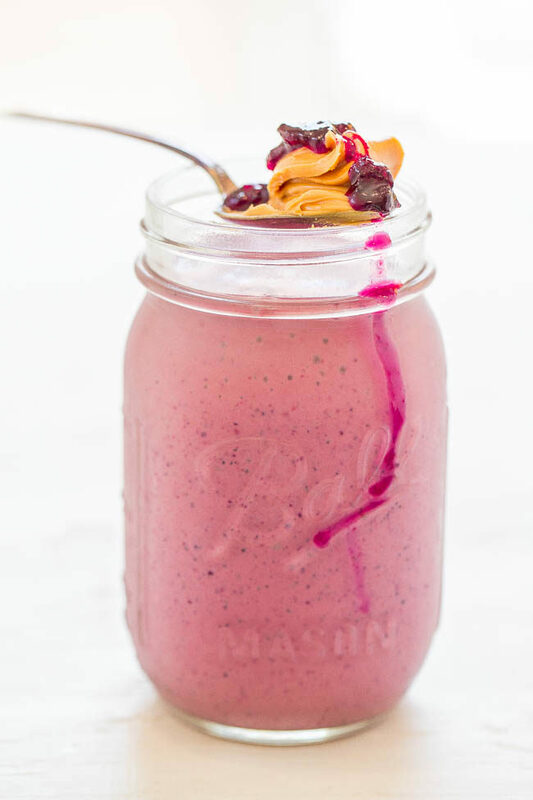 Add the banana, yogurt, frozen berries, peanut butter, and 1/2 cup milk to the canister of a blender. Blend on high power and drizzle in additional milk, as needed, until desired smoothie texture and consistency is achieved. Optionally add ice or sweetener if desired. Serve immediately. 75+ Peanut Butter Recipes on my blog! 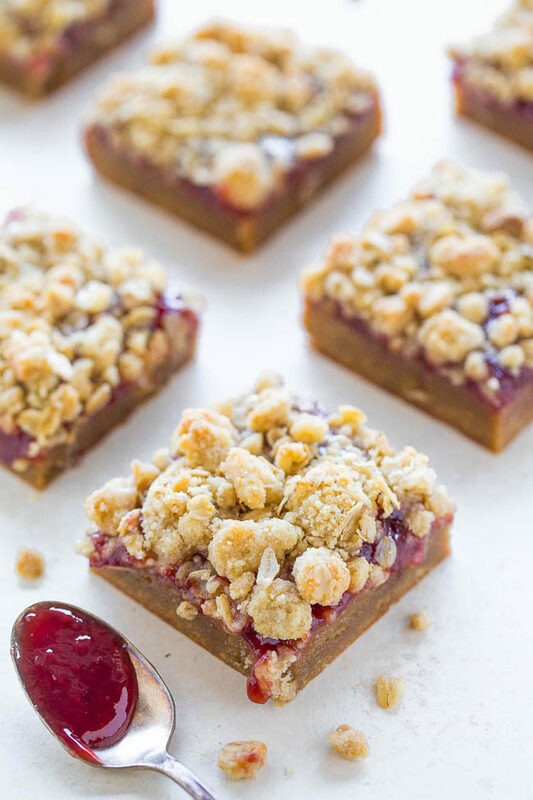 Peanut Butter and Jelly Crumble Bars – Soft and chewy peanut buttery bars topped with strawberry jelly and a crispy oatmeal crumble topping! Easy, no-mixer recipe that’ll be your new favorite way to eat PB & J! 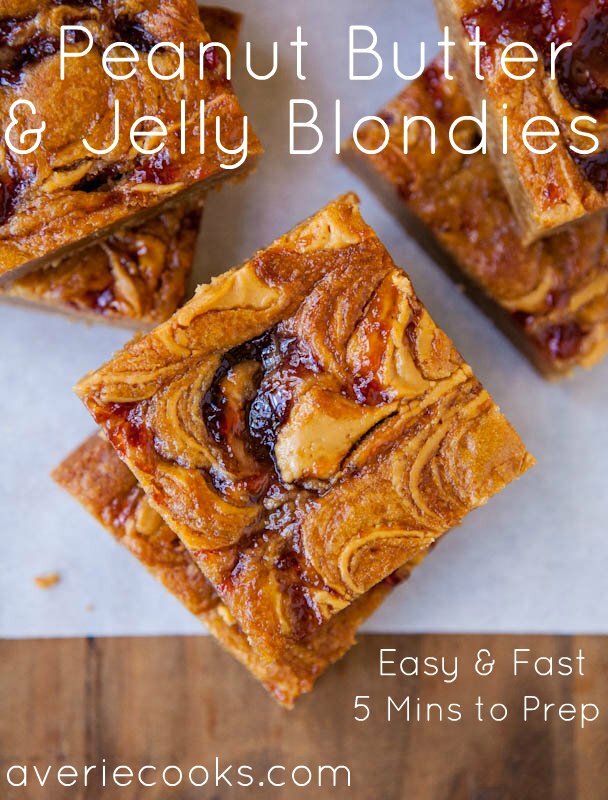 Peanut Butter and Jelly Blondies – An easy, no-mixer recipe with swirls of peanut butter and jelly baked into soft, tender blondies! 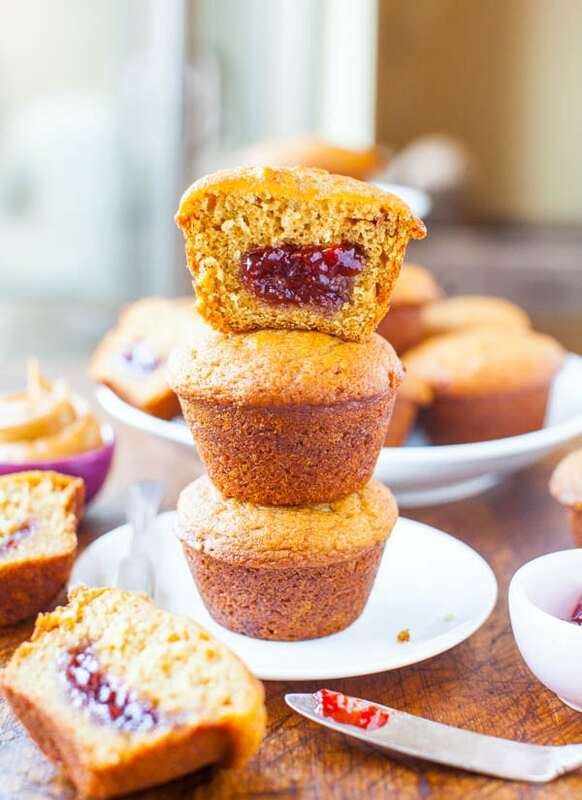 Peanut Butter and Jelly Muffins – Change up the way you eat PB&J and try it baked into these easy muffins! 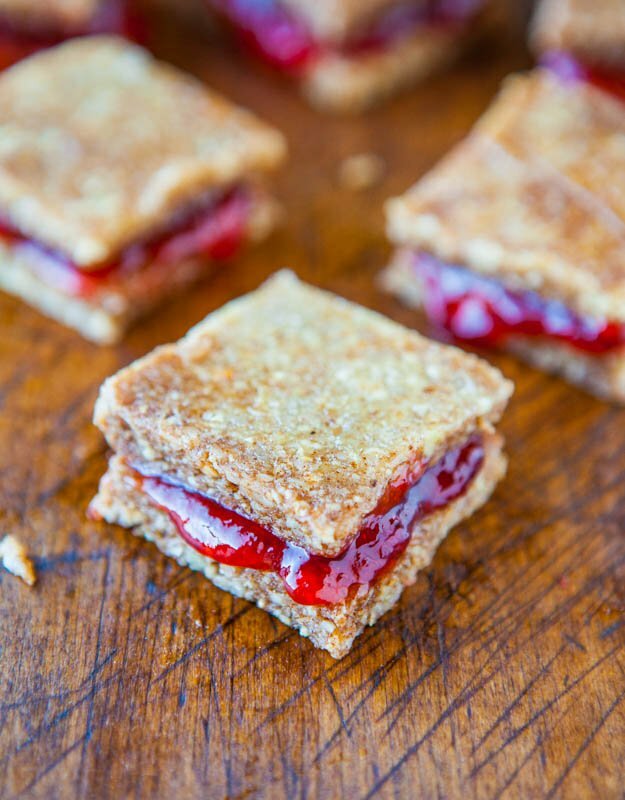 Peanut Butter and Jelly Coconut Cashew Sandwich Cookies – No-bake, vegan, GF, and a healthier way to get your PB&J cookie fix! 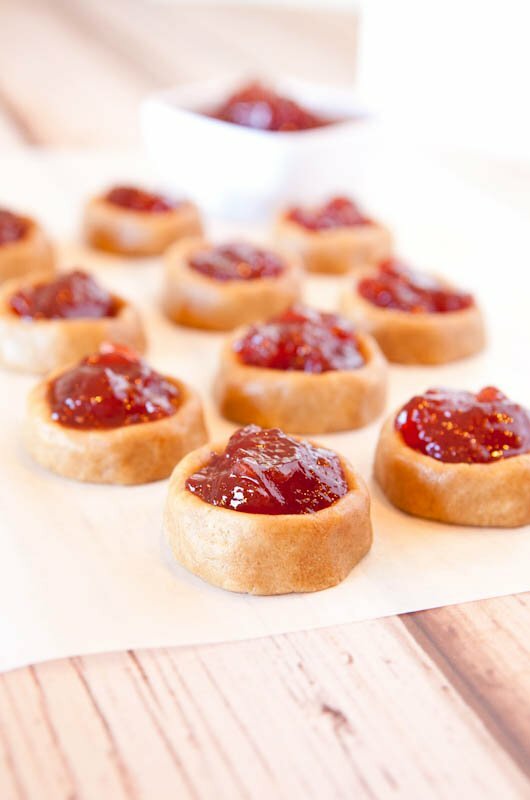 Peanut Butter and Jelly Thumbprint Cookies – A fun spin on traditional thumbprints with these easy, no-bake, vegan, GF cookies! 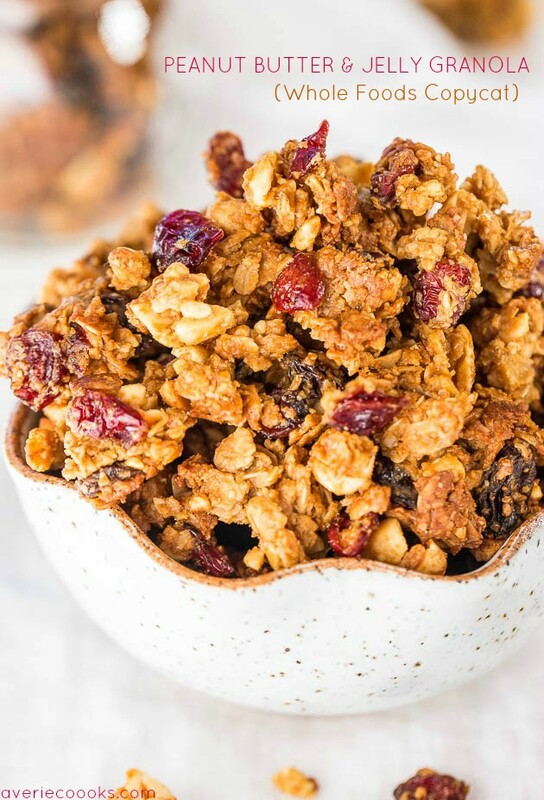 Peanut Butter and Jelly Granola (Whole Foods Copycat) – A copycat granola with PB&J flavors! You’re going to want way more than a handful! Fruit and Yogurt Smoothie – Just 3 ingredients and no added sugar in this sweet and creamy smoothie! Love it when healthy tastes so good! 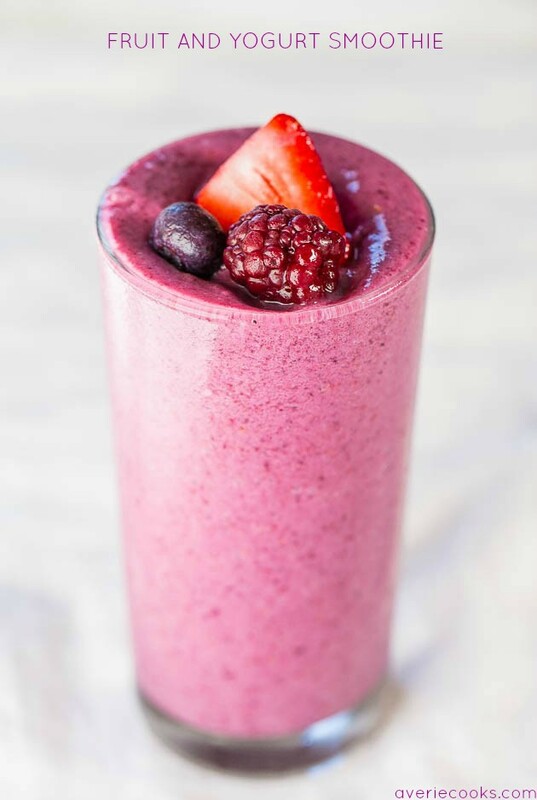 The Best 15 Healthy Smoothies – Fast, easy, and tasty smoothie recipes that’ll keep you full and satisfied and are skinny jeans-friendly! Looks yummy! It’s getting warm enough here to be smoothie season…and to my surprise, I haven’t made one yet. I love them after a run when I’m a little hungry but still want something hydrating and on the sweet side. I’m exactly like you with smoothies. Perfect post-run when it’s warm outside and I want something that’s a little sweet but not too heavy at all. This smoothie tastes like one that they charge $10 for at the smoothie places here in San Diego! This would be great for lunch! I bet my kids will like it this summer. It’s a kid’s dream! Hope they enjoy it! i seriously can’t think of anything better than pb & j!!! just the spoonful of it at the top of this post has me drooling!! i’m so with you on adding greek yogurt – the creaminess is out of control. can’t wait to try this recipe!! Loving these flavors here! Good tip on using the berries instead of the jelly. A perfect use up for all of the summer berries in my fridge! Perfect way to use up some summer berries! And yes jelly just gets lost in this whereas the berries are perfect! Peanut butter is very near and dear to my heart as well. I eat it pretty much every day. This smoothie looks good! I’m liking some of these other peanut butter and jelly recipes I’m seeing too, particularly those crumble bars, whoa! Those PB & J crumble bars are a winner for sure! Hands down the BEST flavor combo for a smoothie ever! I could drink this particular smoothie every.day. and not get sick of it! I was never big on PB&J’s when I was younger, but it seems that as I get older, I crave the combo so much more. I know this smoothie is going to hit the spot – especially with summer finally here. Thanks for sharing! I think I’ve always craved the combo…haha! Yummy! I’m a huge PB & J fan (especially when the PB is melty on toast)…. this sounds like the perfect smoothie to start my day!